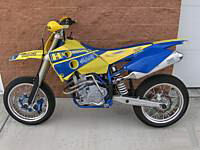 The 2004 KTM 525 EXC Super Motard has custom painted [lastics with KTM colors with metal flake paint, a new rear tire and nice aftermarket parts and upgrades (see list below) and it's in extremely nice condition. This gently used dirt bike has never been wrecked, stunted, used as a racing bike or been down; it's been adult owned and ridden. The used 2004 KTM EXC 525 SuperMotard comes loaded with top of the line mods like a not stock, KTM (Top- of-the-Line) Big Brake Kit, Ackrapovic Titanium Complete Exhaust, GPR Steering Stabilizer, Top of line CVR mirrors. Oversized 3.3 Gallon Clark fuel tank, New Lifetime Battery, Top of Line aftermarket seat, a recent 103 MM Big Bore Kit with JE Piston and Total seal and Rings. It has a stroker kit with all work professionally done by a KTM mechanic. The bike has been ridden approximately 1500 miles since the rebuild and gets 50+ MPG. 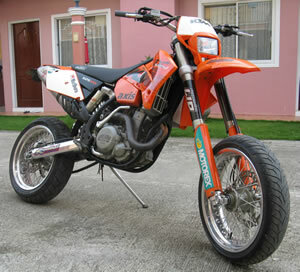 The Super Motard for Sale 2004 not only is in excellent running condition, the used Honda dirt bike for sale. It is located in Jonesburg near St. Louis MO Missouri if you want to make an appointment for a viewing. My asking price is $4500. If you are interested in the Motard, email (and don't forget to mention that you found this ad on GoGoCycles Used Honda Dirt Bikes Classifieds gogocycles.com)with your questions or to make arrangements for payment and pickup of the super motard. 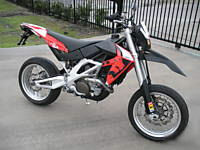 Email me to get a great deal on this used super motard motorcycle and don't forget to mention that you found this ad on GoGoCycle's Used Motorcycles and Parts for Sale www.gogocycles.com. Join in and write your own page! It's easy to do. How? Simply click here to return to HONDA DIRT BIKES for SALE.